The province has an interest in preserving the cultural heritage of all peoples in British Columbia. Part of that heritage is preserved in Archaeological information. Archaeological information comes in many forms; it includes written and visual information and material objects. This information tells us about the nature and context of archaeological sites on the landscape and about the contents found on or buried in archaeological sites. Visual objects may come in the form of photographs, field notes and maps. Material objects may come in the form of soil samples, animal and plant remains, and artifacts made of stone, minerals, bone, antler, shell and—when preserved under special conditions—wood. This information is used by different people for different purposes. One person may be inspired by the work of an ancient artist while another uses the collections to bring about an appreciation of cultural groups by emphasizing their knowledge and technical skills. The more formal use of collections from a scientific perspective is to tell the story of humanity in this portion of the world. Scientists reconstruct patterns of settlement, resource use and human interaction in the past. Larger sets of information are used to reconstruct past lifeways at points in time, to look for and identify those important cultural processes that make cultures the way they are, or to examine the broader picture in the reconstruction of cultural history. There are many sub-sets of material objects that can be used for an endless variety of studies. Through DNA and isotope studies, animal bones become a source of information to help us understand the history and ecology of modern species. Within the subject area of archaeology there has been too much of an emphasis on artifacts, which should be viewed as only one component of archaeology. Artifacts should be viewed not as objects of value in themselves, but as a component of their context—they are part of an assemblage of information; they are meaningful insomuch as they form a part of the landscape. Of course, they may be viewed individually as objects of study or aesthetic admiration. Laws protecting archaeological sites, and the undertaking of archaeological work, are understood to exist for scientific reasons. The information collected about the location of archaeological sites and the information collected within them (maps, photographs, drawings, field notes, food remains in the form of animal bones and plant parts, soil samples and artifacts) constitute evidence of past ways of life. This evidence is a source of information for ongoing research that allows for the building of a picture of past lifeways that becomes a source of inspiration and learning for the present. As further studies are undertaken on museum collections, more data is collected and becomes part of the museum collection. A great deal of effort and money has been put into the collecting and curation of this material over the years. It is important to maintain the scientific integrity of these collections. Material from archaeological surveys and excavations is important in the context of all material related to the reconstruction of past lifeways. The Royal BC Museum began acquiring archaeological material in 1886, under the Provincial Museum Act. The Archaeology collection currently comprises over 215,000 catalogued artifacts representing over 10,000 years of history. Artifacts include objects of First Nation, Euro-American, European and Asian manufacture, but 99% are related to First Nations cultures. 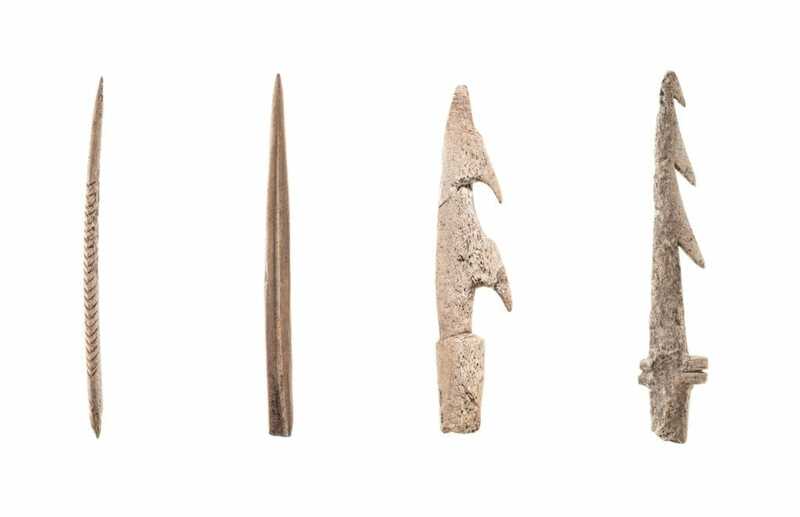 Collections include mostly stone, bone and shell artifacts as well as other smaller categories such as wood, minerals and metals. 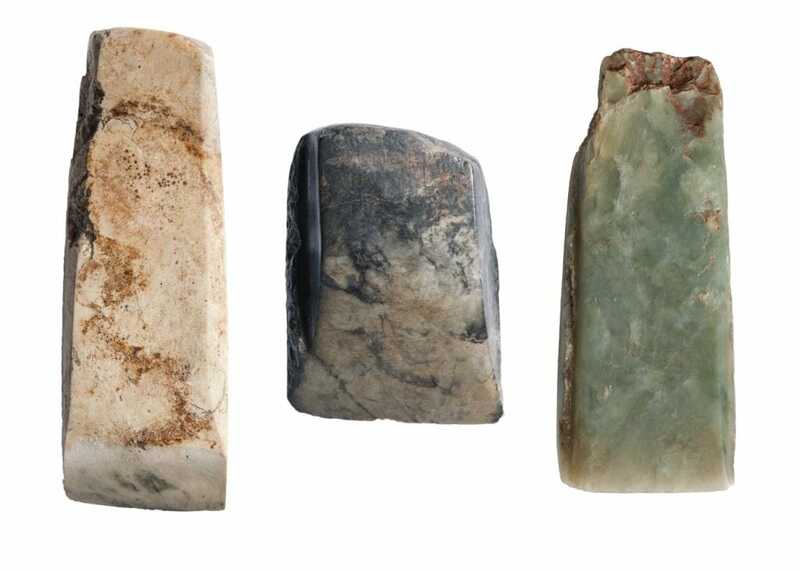 The vast majority of lithic artifacts include waste material discarded in the production of artifacts (cores and flakes) and pieces of broken artifacts. More complete flaked stone artifacts are mostly related to the procurement and processing of food and include what archaeologists call retouched flakes, bifaces and projectile points. 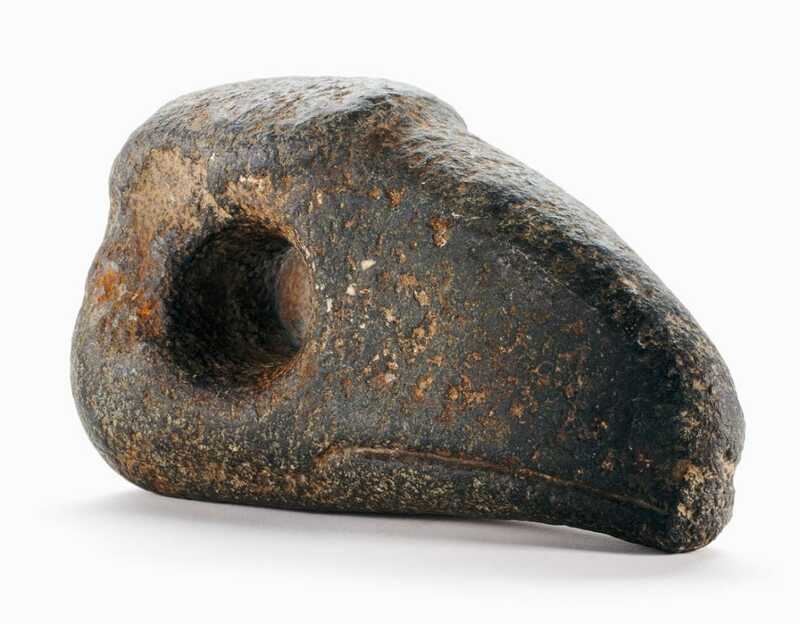 Ground stone artifacts are much less frequent and are dominated by abrading or sharpening stones, artifacts used in woodworking such as hand mauls and adze blades and slate projectile points used in procuring animals. 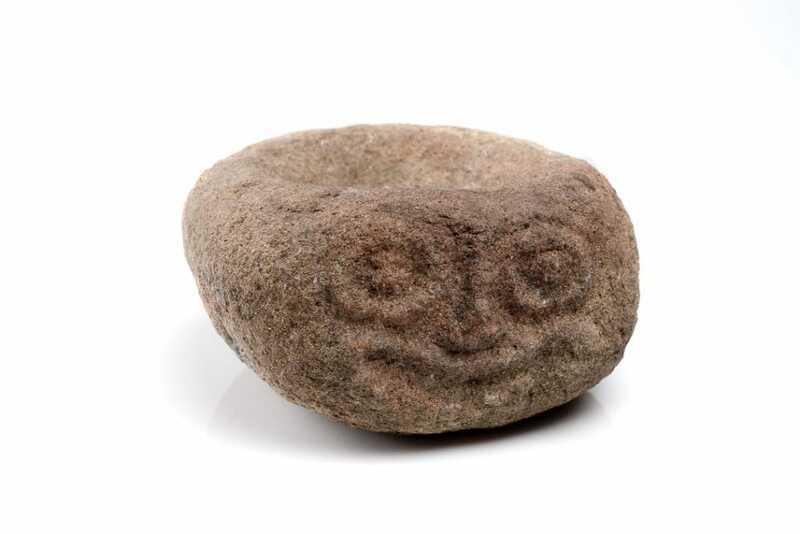 Stone artifacts used for both ritual and utilitarian purposes such as stone bowls are not common in the collection. 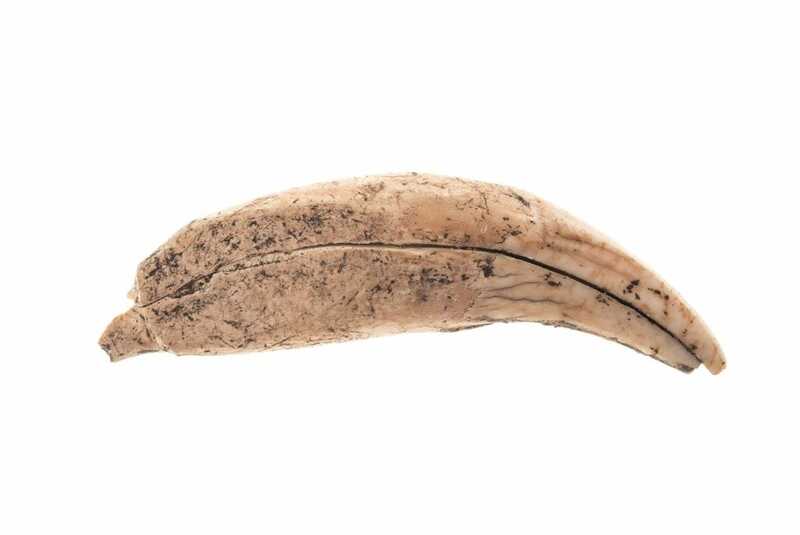 Over 95% of the bone and antler artifacts are from coastal shell-midden sites and include large amounts of fragmentary bone items of unknown use, worked waste material or mostly fragments of tools used in fishing, hunting and the fabrication of plant or fur materials. Social artifacts include mostly items such as stone and shell beads with rarer items of body adornment or carved items of artistic interest. There are also hundreds of cloth petroglyph rubbings and about 350 linear feet of associated excavation and survey materials in the form of artifact catalogue records, archaeological site records, field records, maps and research data. Thousands of associated photographs exist in colour and black and white prints and colour slides. Most of these have not been digitized. Thousands of boxes of non-artifactual material are stored at an off-site warehouse. This includes animal bone and shell samples, charcoal samples for radio-carbon dating, and various types of matrix and soil column samples from archaeological excavations. 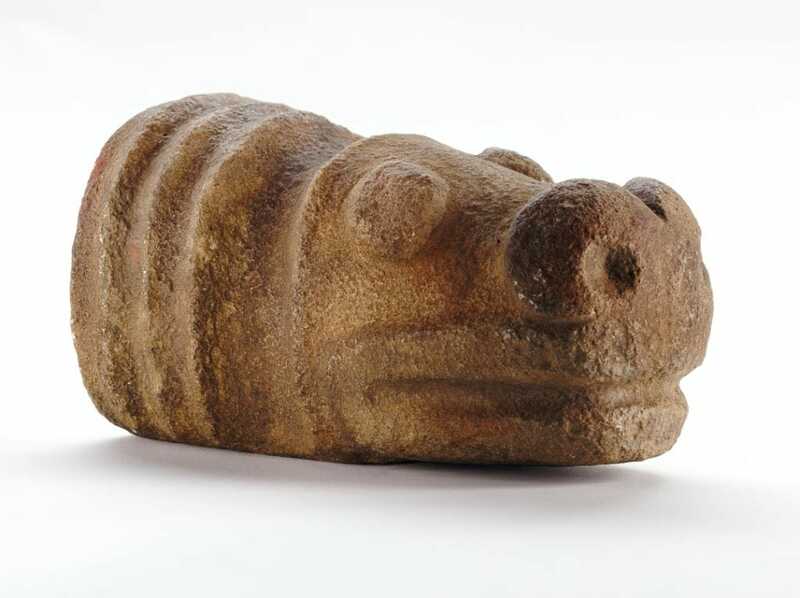 Archaeological material usually cannot be readily linked to representatives of living populations. However, over 70% of the artifacts in the collection are from those areas of the southern province occupied historically by speakers of those different but related languages classified by linguists as part of a Salish language family. In terms of geographical area, the archaeology collection is the strongest on the southern coast and in the southern interior of British Columbia. This is largely because most of the development that results in disturbance to the landscape occurs in areas where the highest populations occur today, and because these are the areas where most archaeological work has been undertaken. Over 90,000 artifacts are from the southern two thirds of Vancouver Island and the lower Fraser River region (below Lytton). There is a distinct south-to-north decline in the number of artifacts represented in the provincial collection. Over 128,000 artifacts (about 45% of the collection) come from below the 50th degree of latitude North, or within the southern 1/11 of the province. The number drops to around 75,000 artifacts between 50 to 52 degrees latitude and to 15,000 between 52 and 54 degrees. Around 7,000 artifacts, or about 3% of the collection, represent the entire northern half of the province between 54 degrees and 60 degrees north. The Royal BC Museum archaeology collection is the most valuable source of information for documenting the early history of First Nations in British Columbia. It contains the largest quantity of artifacts and many artifacts not found in any other collections. These collections are an unique source for reconstructing the history of Indigenous peoples in the province. The wide variety of research that can be undertaken on this collection will form the basis for both academic discussions and public programs long into the future. The collection is strongest in representing a large sampling of study material from the last 3,000 years from the southern coast and southern interior of the province. Almost all of the collection is labeled with a Borden site number designation, and about 95% is entered into a computer database with varying levels of fields entered. The collection is weak in not having much material representing the time period before about 3,000 years ago and in not having well-documented material from many parts of the Province. The electronic documentation of about 20% of the archaeological material is in need of updates and corrections. Almost all of the artifact and site image collection needs to be digitized and linked with an information data base. During the Museum’s first 74 years there was no professional staff-member with specialized training in Archaeology. During the period from the 1880s until the early 1960s, artifact collections were composed of mostly non-scientifically-collected artifacts donated by the public. 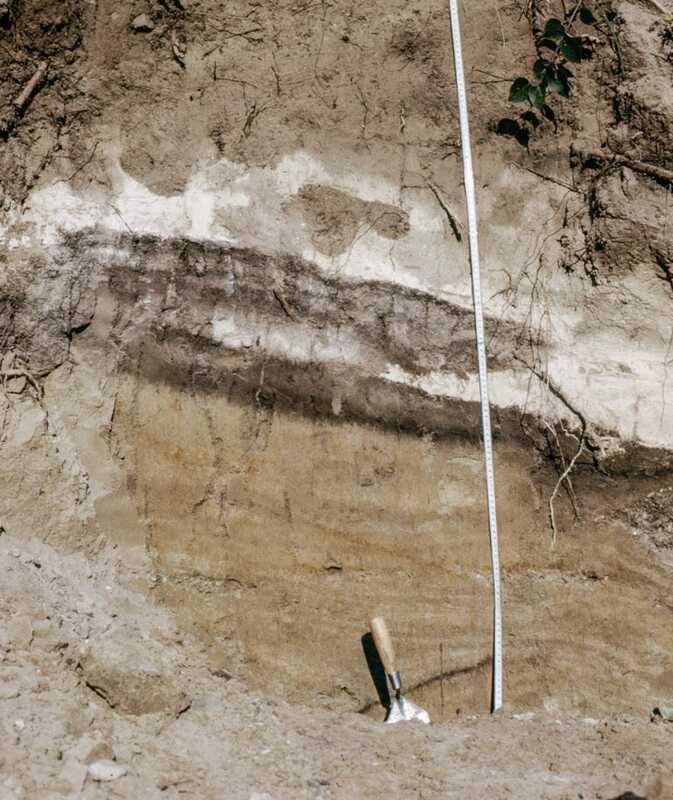 In the mid-1960s and 1970s an increasing number of artifacts and large quantities of related excavation material were collected during the projects of Royal BC Museum archaeologists. The 1960 Archaeological Sites Protection Act and its 1972 replacement, the Archaeological and Historic Sites Protection Act included the development of a permit system that requires archaeologists throughout the province to place the materials and information from their archaeological projects in a repository for both safe keeping and with accessibility for scientific research. The Royal BC Museum has been the main provincial repository for material collected under permit since 1960. With the gradual reduction of Royal BC Museum staff with archaeological training from ten in the mid-1970s to only two since 2000, museum projects have increasingly generated fewer collections. Most archaeological material entering our collection since the mid-1980s has been deposited by private contractors operating under the provincial permit system. Some universities, colleges, community museums and First Nations groups have become repositories of information and material. The University of British Columbia and Simon Fraser University, with active archaeological programs, have been two of the major repositories after the Royal B.C. Museum. It is necessary to have repositories that maintain certain standards with regard to security and storage, and a trained staff that can provide safe handling, proper documentation and accessibility for research and public programming. If the scientific integrity of the collection is not maintained in perpetuity, then the purpose of the laws protecting archaeological sites and the requirements implemented under those laws cease to have a purpose. 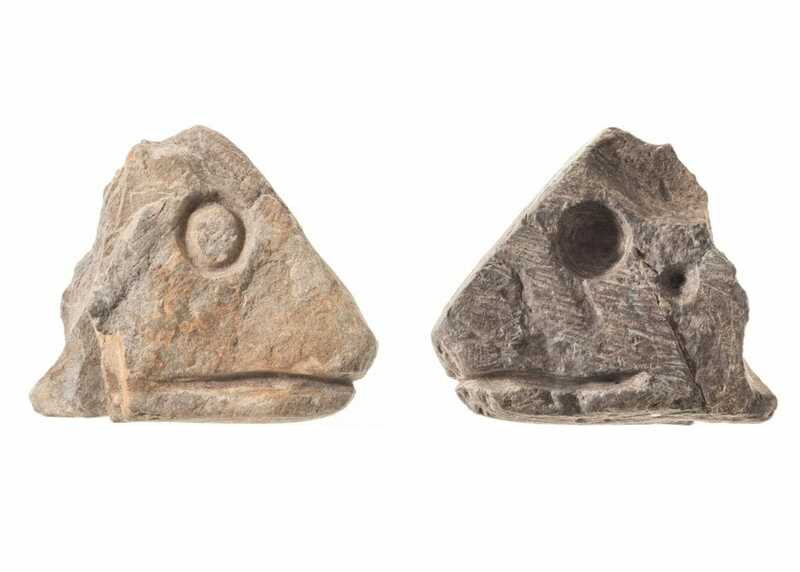 With archaeological contractors working over wider parts of the province, the collections are becoming more representative of the province, but the bias towards the southern coast continues. This is due to the nature of where the work is being carried out as well as the fact that there were large populations in southern areas of the province in ancient times and the sites in that region contain larger varieties of artifact types and faunal remains mostly due to better preservation. Most information about sites and collections pertaining to the history of First Nations in British Columbia are not in museums or other repositories, but remain buried in the ground. Collection materials are therefore of importance in providing a record of the location and potential importance of those sources of information about human history that still remain uncollected and unstudied. It is important to promote the documentation, protection and preservation of our province's buried history for purposes to be determined by future generations. Even scientific study of ancient sites is a process of destruction. We always need to keep in mind that later generations may be able to extract far more information from these resources than we are capable of doing with our present knowledge and technology. In addition to the scientific purposes of the collections is their use in public programming and artistic endeavors. Objects and visuals of an archaeological nature may be used as part of the explanatory framework of larger concepts where they are representative of things or ideas. Public program use of artifacts has mostly involved their use in exhibits, school programs, special tours, publications and on the museum’s web site. The use of artifacts and other archaeological material in public programs must not endanger the scientific integrity of the collections. Although scientific information is recorded during the collection and report-writing process, an important value of collections lays in the many kinds of follow-up studies undertaken on the collection and the comparison studies with other archaeological assemblages. Continuing access to this information is important to maintain the scientific usefulness of the collections. There are many kinds of follow-up studies that we will be able to do in the future as our ideas and technological abilities evolve. Most of the artifacts in our collection have not been included in the published literature. Increasingly, many of our new collections are discussed in government permit reports, but these have restricted use for purposes of site protection. Researchers are welcome to examine the collections by contacting the appropriate curator and making arrangements with the collections manager. Please give as much notice as possible. You may contact museum staff by e-mail, letter or phone. We need to know which archaeological collections material you wish to examine and the purpose or your intended examination. Restrictions may apply with some sensitive material or with regard to agreements between the Royal BC Museum and certain First Nations. We will want to know the expected dates of your visit. Collection access is normally between 9:00 AM to 4:30 PM, Monday to Friday, unless otherwise arranged with the curator or collection manager. Archaeological collections are not loaned out, except under special circumstances for exhibit purposes—and even then, only under strict Conservation protocols.